Five hundred hours of video are uploaded to YouTube every minute, so you’ll literally never be able to watch everything. The real challenge is sorting through everything that you could be watching and deciding what sounds good—like you could in the old days of TV. Why can’t you channel surf the web, the way you used to surf cable channels? That is the question PlutoTV tries to answer, and it does a pretty good job. There are live TV stations, including The Weather Network and Bloomberg News. 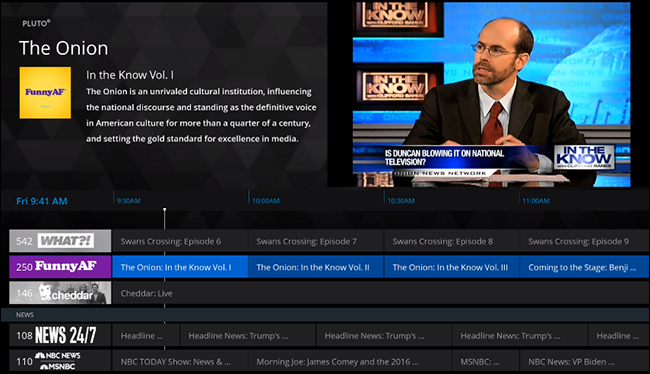 But there are also “channels” offering videos you can find elsewhere online, curated into a format that feels just like flipping through TV. And best of all: it’s completely free (and legal). There are similar channels for classic cartoons, technology news, and well-known internet brands like Cracked, Nerdist, and The Onion. There’s a channel with just standup comedy, a channel with just fail videos, and a couple of channels with week-long “slow” TV, allowing you to watch things like a train traversing Norway in real time. There’s live footage of animals, and numerous channels with old cartoons. Here are the complete channel listings, if you’re curious. This isn’t going to replace a cable package entirely, and it’s not going to be the only place you go to watch video. But it’s a great application to have on hand for those moments when you don’t know what you want to watch, and don’t feel like scrolling through Hulu/Netflix/Amazon. 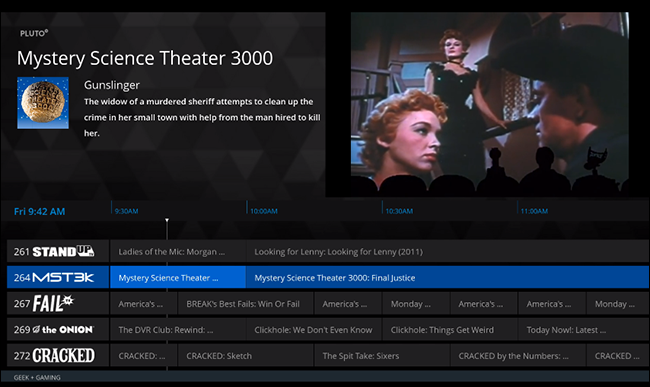 If you’re on your computer, it’s easy to get started: just head to Pluto.TV and click the “Watch Now” button. In our tests the site refused to load at all if you have an ad blocker set up, so if you can’t get the site to load that’s probably why. You’ll also need Flash installed for some, but not all, channels to work. There are apps for Windows and Mac users, but both seem to be little more than a browser running the application in its own window. There are also versions for Android and iOS, so basically you’re covered on every platform. Here are links to every version of the app; just click the platform you use to get started. Note that there are different versions for PC and mobile depending on whether you reside in the United States, and that viewers outside the United States will see fewer channels. This is a legal matter: Pluto doesn’t have the rights to content in all markets. Hopefully that will change as the service continues to grow, but for now this is worth a look regardless.